The simple way to manage your teams and athletes. 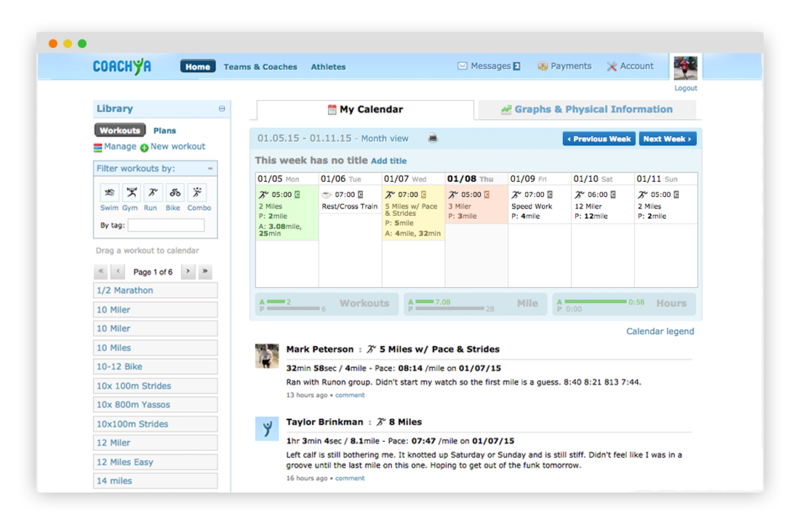 Coachya provides coach management software that allows you to create custom workouts, deliver training plans, and monitor your athletes' workout logs. Why choose Coachya? Because managing your athletes and coaching business should be easy and affordable. Choose Coachya when spreadsheets and Google Docs aren’t enough. There may be other options out there, but they’re expensive and difficult to set up. We’ve built a platform that is simple, economical, and will change the way you manage your teams and athletes. "I've analyzed few alternatives and found Coachya to be the best. Coachya's team support and simplicity were key factors in my decision." Save time and get organized with Coachya’s billing system. This is great for reoccurring membership fees, workshops, and private training sessions. Athletes get notified a day before their scheduled workouts via email. And you get notified when they complete a workout. You can also communicate with them using the in-app messaging system or post a message in their feed. Create a team with your athletes and send them team or individualized training plans. Athletes can see plans / workouts, motivate each other, and share race results. Athletes can keep track of their progress using workout logs, graphs and statistics. As a coach, you can revise workouts based on feedback posted in their workout logs. Athletes can log their workouts from our desktop training platform or sync their workout summaries from the RunKeeper training app. Athletes can give you feedback so you can adjust their training. Create custom workouts based on your training techniques. Use workouts from this library to build training plans. You can drag/drop workouts and plans into an athlete or team’s calendar. "I’ve been waiting for a solution like Coachya for a long time. I work with a long list of athletes and it’s hard keep up. Coachya helps me keep all my teams and private athletes in order, and I don’t have to mess with complicated Excel charts or files. Everything is in one place, easily accessible when I need it." Transform the way you train your athletes. Get set up with Coachya today! © 2019 Coachya Inc. All Rights Reserved.